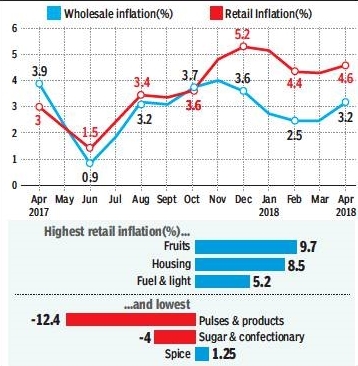 Retail and wholesale inflation climbed up in April on the back of higher food and fuel prices, dashing hopes for any interest rate cut for now as the Reserve Bank of India is expected to remain cautious about the build-up in inflationary pressures. Retail inflation, as measured by the Consumer Price Index, rose for the first time in four months to 4.6% in April,faster than the previous month’s 4.3%. Rural inflation stood at 4.7%, while urban inflation was at 4.4%. Fruit prices rose an annual 9.7% during April, while housing shot up 8.5%. Fuel and light rose 5.2%,while food and beverages grew 3%. Separate data released by the Commerce and Industry ministry showed inflation, measured by the Wholesale Price Index, rising to a 4-month high of 3.2% in April, higher than the previous month’s 2.5%. Potato prices rose an annual 67.9%, while fruit prices shot up 19.5% during the month. Fuel and power prices rose 7.8%, a result of the hardening of global crude oil prices.